American architect Michael Graves divides architectural design into three distinctive moments: referential sketches, preparatory studies, and final drawing. This book is a visual diary that shows the architects attention to the legacy of the past and how the observation of the world leads to the creation of new forms with tangible features. 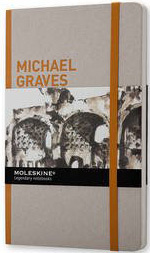 Graves has been active with his studio since 1964 and has been a professor at Princeton University for over 40 years. He has designed more than 400 buildings around the world, receiving over 250 awards for the excellence of his work. Milan 15xm x 21cm, 144pp, illustrated, hardback.